The JSE inched higher on Thursday as retailers and blue-chip index heavyweights firmed. There was some disappointment in the mining production numbers for July released earlier in the day. Year-on-year mining production contracted by 5.2%, missing the forecast growth of 3%, while month-on-month production decreased by 8.6%, much worse than the estimated growth of 0.4%. The biggest contraction was recorded in gold production, which decreased 15% y/y, while platinum production contracted by -6.2%. The biggest mover of the day was Aspen [JSE:APN], which tumbled dramatically by over 25% from its open of R260.13, to reach a session low of R201.55. This was after the release of its full-year results in which the business indicated that it would be selling its nutritionals business to focus on its core pharmaceuticals operations. The stock eventually closed 14.84% lower at R230.63 per share. Reinet [JSE:REI] traded softer to end the day down 3.95% at R272.66, while Adcock Ingram [JSE:AIP] weakened 3.44% to R63.36 per share. Net 1 UEPS [JSE:NT1] was among the day’s biggest gainers, jumping 21.43% to close at R110.50 per share. 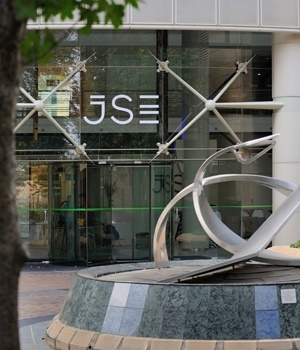 More modest gains were recorded on the blue-chip index, with The Foschini Group [JSE:TFG] gaining 3.37% to R165.57 and Mr Price [JSE:MRP] adding 1.82% to R214.83. Naspers [JSE:NPN] tracked Tencent firmer, closing up 3.31% at R3 155 a piece. Impala Platinum [JSE:IMP] was buoyed by the release of its full-year results which reflected a marked improvement in the miner’s profitability. The stock closed the day up 5.38% at R17.63 per share. The JSE Top-40 index was mixed but eventually managed to end the day 0.35% firmer, while the JSE All-Share index gained 0.38%. The Resources index closed 0.14% weaker, however the Industrials and Financials indices gained 0.62% and 0.2% respectively. The rand extended its gains as it rallied to a session high of R14.62 against the greenback. At 17:00 it had retraced to trade at R14.74/$, but was still 1.3% firmer on the day. Brent crude retreated as global stockpiles data showed that inventories were still high despite the potential supply threats due to the hurricane approaching the US coast. The commodity was trading at $78.18/barrel just after the JSE close. At 17:00, gold was trading 0.22% softer at $1 203.45/oz, platinum gained 0.41% to $803.07/oz and palladium was 0.61% firmer at $983.83/oz. Cryptocurrencies found some reprieve, with Bitcoin gaining 3.29% to $6 480.10/coin, while Ethereum jumped 16.95% to trade at $201.63/coin.